First off, let me apologize for my lack of posts over the past week. As you all know, I am a HUGE Cincinnati Reds fan and they were in the NLDS last Tuesday through Thursday and tragically lost. Hence why I have not posted. Okay, let’s begin. A few weeks back, USF was playing Temple on a Saturday at 12:00pm. This game was only on the Big East Network which, unfortunately, we do not get at home. Rather than go to our usual Ale House to watch the game, we decided to go to Foxboro Sports Bar & Tavern. It has been many, many years since I last ate at Foxboro – it is on completely the other end of town – but, I had recalled the food as being pretty good. Plus, all of their booths have tv’s in them. Perfect, we thought. If only we realized then, what we know now, we would have totally skipped over this Wicked Gross food. Foxboro is a New England Sports Bar. Images of Tom, Nomar & Big Papi fill the place up. We arrived at almost 1pm to a fairly empty restaurant. Some what strange considering it was a College Football Sunday. We sat in our booth and flipped the game on. This is the 1 area where Foxboro scores highly in my book. It was great having the game on right next to us rather than needing to find a tv or request for the game to be put on. Since we would be there a while, we decided to first order an appetizer. We ordered the Mild Wings with Blue Cheese and Celery. Side Note – the Blue Cheese and Celery is an upcharge here…yeah, not good. I do not have a photo of the wings but, let me tell you – these were the WORST wings I have ever, ever, ever had. I am not a big wing fan but, both Mommy and Taylor agreed with me. The wings were small & tasted of freezer burn and wayyy over frying. Words do not explain just how bad these were. And the blue cheese was so bad, that it was no help either. If our waitress was better, I would have complained and complained about these. 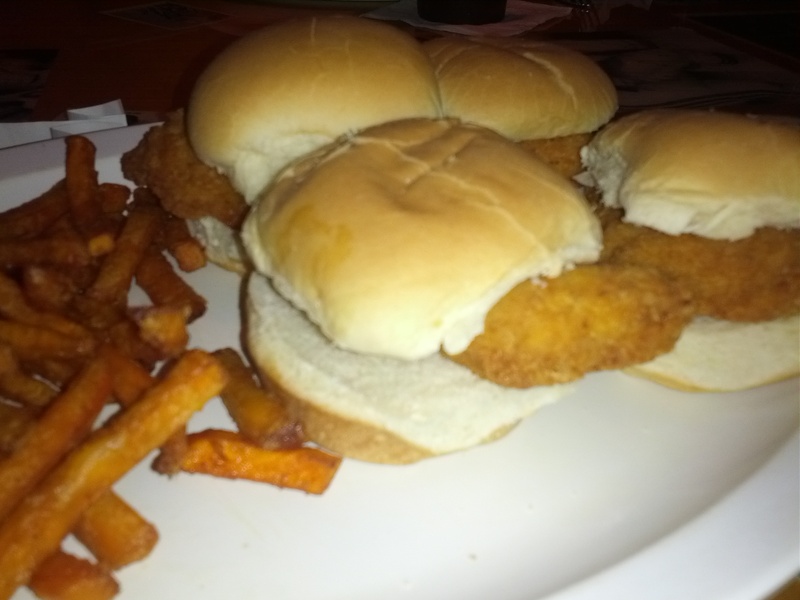 For my meal, I decided to go with the Chicken Sliders and Sweet Potato Fries. I wanted to try the fries and the sliders were one of my only choices. I guess I figured these would be grilled chicken but, I come to find out, it was fried chicken. While this usually isn’t an issue, it would have been nice if they specified on the menu. If they would have been so kind to do that, I would have never ordered these. What arrived to me were pieces of chicken tenders on a bun – that’s it. No cheese, no pickles, no sauces. I asked for bbq sauce to go with them and, it’s a good thing I did. The buns were stale and very sugary. The chicken tenders were fully cooked, but really had no main flavor. Without the bbq sauce – which was also subpar – I would not have been able to eat these whatsoever. 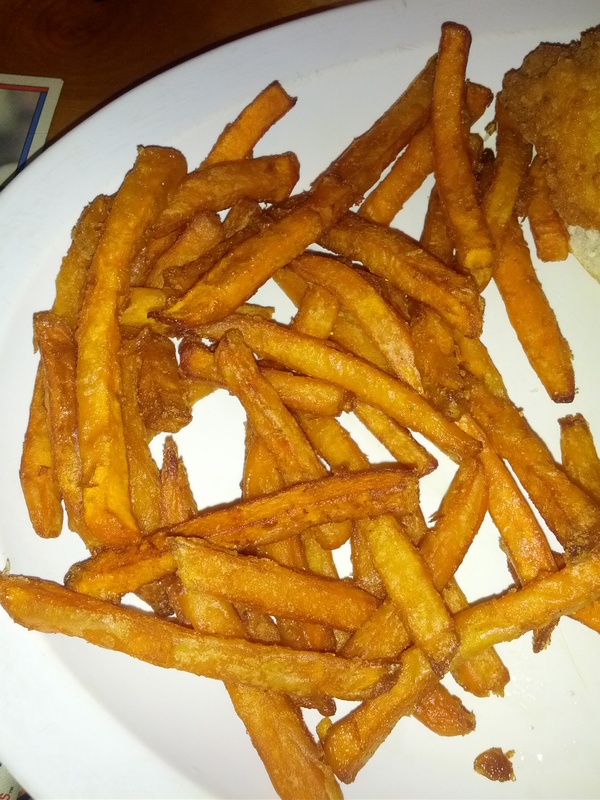 As for the sweet potato fries? Well, they were definitely of the frozen variety and had a very artificial flavor. Even frozen sweet potato fries I buy at home, taste better than these. These fries were so fake tasting and so so so sweet. It was like the sweetness was baked into them and they were packed with sugar rather than with sweet potato. The fries were indeed cooked up nicely but, the gross flavor was just too overpowering. It totally killed the fries and I had a hard time eating them. Neither Taylor nor Mommy were impressed with their meal either. While the prices were fair, the food we received for these prices, was not fair. Also, if you plan on charging for blue cheese & celery, it would be nice if you could mention that on the menu. I really wanted to like the food at Foxboro. As I mentioned, the tv setup is great but, the food is just so bad that I will never return. USF ended up losing the game – a game they should have won by leaps and bounds – and the overall time spent at Foxboro was a waste. If you are in the mood for a New England themed sports bar, and enjoy bad food, than checkout Foxboro. I guarantee you that you will leave with the remnants of Wicked Gross food in your Bill Half-Sleeve Sweatshirt.